Back in 2006, when Roddy Woomble, the lead singer of Idlewild, released his debut album My Secret Is My Silenced, Idlewild had just enjoyed the most successful period of their career. Their third album, 2000s 100 Broken Windows was certified silver, while 2002s The Remote Part was certified gold and 2005s Warnings/Promises was then certified silver. Following the release of Warnings/Promises, Idlewild headed on the longest and most grueling tour of their career. They toured throughout Britain, played some of the biggest festivals and opened for The Pixies and R.E.M. Then in November 2005, Idlewild announced they were parting company with their record company Parlaphone. Left without a record company, soon rumors about Idlewild’s future started doing the rounds. One of them was, that Idlewild were about to split up. That wasn’t the case, although bassist Gavin Fox left Idlewild, after a concert in Glasgow. Without a record company, and having lost their bassist, Idlewild were at a crossroads. So, Roddy Woomble started work on his solo album, My Secret Is My Silenced. When work began on My Secret Is My Silenced Roddy collaborated with Rod Jones, Karine Polwart and Michael Angus. Produced by John McCusker, a folk musician, My Secret Is My Silence was well received by critics. Encouraged by this, Roddy decided to split his time between his solo career and Idlewild. This was no bad thing, as Idlewild would no longer enjoy the success they once had. With new bassist, Gareth Jones, formerly of Astrid replacing Gavin Fox, Idlewild began work on what became Make Another World. Released in March 2007, on Sequel Records, Make Another World was produced by Dave Eringa. It reached number twenty-four in the UK, which made Make Another World, Idlewild’s least successful album since 1998s Hope Is Important. Following Make Another World, Roddy embarked on another new project, before rejoining Idlewild. After the release of Make Another World, Kris Drever and John McCusker collaborated on Before The Ruin. Joining Roddy, Kris and John, were Teenage Fanclub’s Norman Blake and Radiohead’s drummer Phil Selway. Released in September 2008, on Navigator Records, Before The Ruin reached number 156 in the UK. Having enjoyed this collaboration, Roddy headed back to his day-job with Idlewild. Following a gap of two years, Roddy returned with his sophomore solo album The Impossible Song and Other Songs. It was recorded in Mull, where Roddy and wife now lived. Recording took place at the Mull’s art centre. Released in March 2011, on Greenvoe Records, The Impossible Song and Other Songs was a much more eclectic album, although Roddy remained true to his folk roots. Reaching number seventy-three in the UK, Roddy’s this was the most successful album of his solo career. Two years later, Roddy returned with Listen To Keep, his third solo album. Just like The Impossible Song and Other Songs, Listen To Keep, which was released on Reveal Records, was recorded in Mull. Ten of the eleven tracks were written by Roddy and Sorren, with Seonaid Aitken writing the string arrangement. The exception was the title-track, Listen To Keep. It was penned by Roddy, Seonaid and Sorren McLean. Recording of the eleven tracks that became Listen To Keep, took place at Mull’s art centre. The band that accompanied Roddy on Listen To Keep, were Seonaid Aitken on violin, piano and keyboards, bassist Gavin Fox and Danny Grant on drums, percussion and harmonium. Sorren McLean played banjo, harmonium, acoustic and electric guitar. They were joined by various guest artists, who often, only played on one or two tracks. Having said that, they played their part in the success of Listen To Keep, which I’ll tell you about. Opening Listen To Keep, is Making Myths Just drums, guitar and piano provide a melancholy backdrop for Roddy’s worldweary vocal. Full of hurt, he’s heard the excuses before. No more though. He’s decided it’s time to walk away. A lap steel provides a heartbreaking accompaniment to Roddy. It reflects his hurt, while harmonies try to sooth hurt, during his heartachingly beautiful tale of love gone wrong, where folk and Americana unite. The Last Of My Kind is a fusion of everything from Americana, country, Celtic and folk combine. Driven along by fiddles, guitars and drums, Roddy’s mid-Atlantic vocal is full of emotion and frustration. Soon, his build kick loose. With the drums providing the heartbeat, guitars jangle and fiddles and piano add a dramatic backdrop while harmonies accompany his emotive, soulful vocal. Listen To Keep benefits from a deliberate, dramatic and moody backdrop. The tempo is slow as Roddy delivers a vocal that’s heartfelt and laden with emotion. Against a backdrop of drums, violin, harmonium and harmonies Roddy delivers a vocal that’s impassioned and sincere. Build It To Break sees Sebastien Brice join Roddy on lead vocal. This is a relationship song, which is a fusion of Americana, folk and Celtic music. Guitars are joined by a lap steel, which provides its trademark weeping sound. They’re accompanied by tender, cooing harmonies which are the perfect foil to Roddy’s lived-in vocal. His vocal full of confusion as he thinks about his relationship, wonders while he didn’t Build It To Break, was that the case with his partner? Sometimes, when Roddy sings, his vocal is reminiscent of Roddy Frame. That’s the case on Trouble Your Door. A myriad of fiddles and acoustic guitars accompanies his vocal. Fusing country, Celtic and folk, his vocal is heartfelt and emotive on a track whose roots belong midway between Scotland and America. There’s a sense of melancholia to Traveling Light, as memories come flooding back to Roddy. Remembering when they first met, he thinks of the woman who he was enchanted by. She traveled light, but he never forgot her. Just guitars drive the arrangement along, while a female vocal answers his call. Vering between emotion and joy at what he had, to regret and sadness at what he’s lost, Roddy unleashes one of his most effective and emotive vocals on Listen To Keep. With an understated arrangement, The Universe Is On My Side unfolds. Just subtle drums and acoustic guitar accompany Roddy’s pensive vocal. Soon, you can’t help but draw comparisons with Lloyd Cole. It’s the intelligent, thoughtful lyrics and Roddy’s languid delivery. Meanwhile, strings add a wistful sound while the arrangement grows in power and drama. Searing guitars, harmonies and piano provide the backdrop to Roddy’s vocal on this compelling fusion of indie pop, Americana and folk. I Know Where I Went Wrong almost bursts into life. Guitars jangle as the rhythm section propel the arrangement along. Sounding not unlike Lloyd Cole and The Commotions circa, Rattlesnakes, pop and indie rock combine. Stabs of piano and strident guitars accompany Roddy as almost relieved he sings “I Know Where I Went Wrong.” As if to celebrate, Roddy and his band showcase their considerable skills. Unleashing a rockier style, this is a side to Roddy Woomble that we’ve not heard before. Let’s hope we hear it again. Searing, choppy guitar licks and deliberate, stabs of piano accompany Roddy on Treacle & Tobacco. Confident and self-assured he sings: “we can go and have our own adventures go, and have our own dreams.” There’s no doubt in his mind, that everything’s going to turn out fine, even though: “the world we live in is a dangerous place.” Instead he knows; “we’ll meet around this family table.” Accompanied by urgent harmonies, and a piano that’s at the heart of the arrangement, while Roddy’s vocal is self-assured, happy and hopeful. A lone acoustic guitar opens Into The Distance On Luck. Chiming, it mmeanders along, accompanied by Roddy’s thoughtful vocal. Drums pound ominously, reinforcing Roddy’s lyric: “the nettles that grow from your heart, there’s a lot to dig through.” Later, mysteriously, Roddy delivers the lyric: “I could be lying or telling the truth. These are both examples of the quality of lyrics Roddy can write. When he delivers them, he breathes life, meaning and emotion into them. 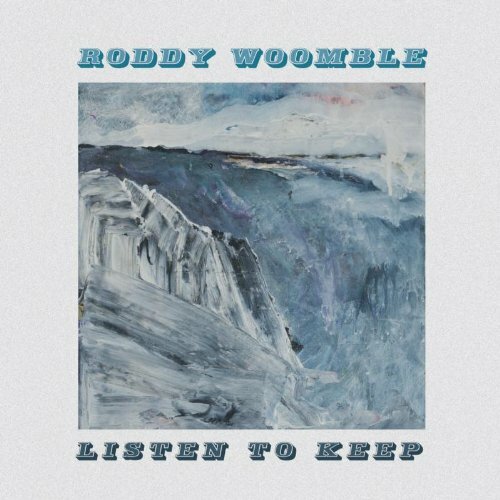 Closing Listen To Keep, Roddy Woomble’s thrid solo album, is Time By Time, a fusion of folk, Americana, blues and Celtic music. Confident, strident guitars accompany Roddy’s heartbroken vocal. Harmonies accompany him as he sings of trying to let go and make a clean break. Twenty years is a lot to let go though. He’s determined not to let his hurt show. Fiddles add a melancholy backdrop to Roddy’s vocal. From there, the fiddles and guitars take centre-stage, driving the arrangement to this bittersweet song along to its Celtic crescendo. Listen To Keep is the result of Roddy Woomble’s eighteen year musical journey. This started when Idlewild were formed in 1995. Since then, Roddy has enjoy critical acclaim and commercial success. After two silver discs and a gold disc, Idlewild split with Parlaphone and a year later, his solo career began. Seven years later, Listen To Keep is Roddy’s third solo album. It’s also his most accomplished and eclectic album. Featuring eleven songs, Listen To Keep ten of the eleven tracks were written by Roddy and Seonaid Aitken. The exception was the title-track, Listen To Keep, which Roddy, Seonaid and Sorren McLean cowrote. Recorded on the beautiful island of Mull, at the local art centre, this must have been an inspirational place to record an album. Its rugged beauty and isolation resulted in an outpouring of creativity from Roddy and his tight, talented band. Fusing folk, Americana, Celtic, country, pop and indie rock, Listen To Keep is an album that you put on and lose yourself in. Roddy introduces you to a cast of characters. Many of them have had their heart broken, some have been hurt and many are lost and lonely. All of them are very human. These characters have the same faults and problems as us. So in many ways, the songs on Listen To Keep are songs that everyone can relate to. After all, hurt and heartbreak, loneliness and loss are things we’ve all experienced. So too are hope and joy, which feature on Treacle and Tobacco, one of the many highlights of Listen To Keep. Influenced by everyone from the Americana of Wilco and Jayhawks, through to two legends of Scottish music, Lloyd Cole and Roddy Frame, Roddy Woomble’s third solo album Listen To Keep is a fusion of musical genres and influences. Featuring eleven tracks which veer between hurt and heartbreak right through to happiness and hope, Roddy Woomble breathes life, meaning and emotion into the lyrics. Delivered with tenderness, frustration and sadness, Roddy Woomble is the latest in a long line of talented troubled troubadours from Scotland’s shore. His latest offering is Listen To Keep, is the result of Roddy Woomble’s eighteen year musical journey. Standout Tracks: Making Myths, The Last Of My Kind, Build It To Break and Treacle and Tobacco. Hi Derek. I enjoyed your review of Roddy Woomble’s latest album. You can always tell when a reviewer has really listened to a record. Keep up the good work! Hope you don’t mind but a couple of wee corrections – The album was co-written by Roddy and Sorren Maclean with Seonaid Aitken writing the string arrangement on the title track. Also his first solo album is My Secret Is My Silence – no D on the end! Hope you can catch one of their gigs somewhere down the road. The band recently played a wonderful night in Iona village hall which was really special. And there’s talk of a live album maybe next year. Best wishes, Gordon. Thanks for your comments. I’m really glad you enjoyed the review. It was a pleasure reviewing Listen To Keep, it’s one of my favourite albums of 2013, along with albums by Quickbeam and Woodenbox. Thanks for pointing out my errors. That was kind. I’d rather get things right. I’m hoping that sometime soon, I’ll catch Roddy live. Seeing Roddy in Mull must be the best place to see him. It’s also a really beautiful place. You’re lucky if you live there. Keep reading my blog, there’s lots more coming. Something new each day.